Shukrie: Under SCORE, we focused a lot on fixing the basics and increasing the revenue of certain old businesses, but in SCORE 2.0, we are focusing a lot more on e-commerce. YOU can grab a burger or freshly brewed coffee at a drive-through. But did you know that you can send a parcel at some post offices as well, without the hassle of looking for parking and carrying a heavy box to the counter? This is one of the many services that Pos Malaysia is providing in a bid to become a key player in the logistics sector and to cater for the market’s changing needs. “We have, and are, evolving to meet the demands and needs of our customers and the marketplace,” says CEO Datuk Mohd Shukrie Salleh. According to him, there are two major paths — financial or logistics — that postal organisations around the world can take to survive. “In our case, we made a very clear decision. We want to be in the logistics sector, not financial (services),” Shukrie tells The Edge in his first sit-down interview with the press. “We are continuously innovating and pushing our boundaries to reach even greater heights. Moving forward, we endeavour to be a leading fully integrated logistics service provider offering end-to-end logistics solutions to businesses and individuals alike,” he explains. Change is the only constant. The way to stay close to the customers and remain relevant is to actively listen, understand and adapt to their ever-changing needs. “This is exactly what we intend to do,” says Shukrie, who became CEO in 2015. The national postal services provider has morphed into a conglomerate, offering supply chain solutions to compete directly and indirectly with local and international logistic players. Riding the e-commerce wave, Pos Malaysia is in the second phase of its transformation programme, SCORE 2.0, which was introduced in April last year. “Under SCORE, we focused a lot on fixing the basics and increasing the revenue of certain old businesses, but in SCORE 2.0, we are focusing a lot more on e-commerce,” says Shukrie. SCORE stands for solutions driven by technology; customer centricity; operational efficiency; revenue and geographic diversification; and enabler capabilities. Shukrie started the transformation when he was seconded from KL Airport Services Sdn Bhd (KLAS), now Pos Aviation, after DRB-Hicom Bhd acquired a 32.21% stake in Pos Malaysia. The stake was bought from Khazanah Nasional Bhd for RM622.79 million, or RM3.60 per share, in 2011. Parachuted into the former government-linked company as chief operating officer, he took to the job like a duck to water. It was he who proposed that Pos Malaysia take over KLAS from DRB-Hicom but the plan sent the postal group’s share price to a multi-year low of RM2 in March last year amid doubts over the merits of the asset acquisition. That it was a related-party transaction did not help at all. Adding to the selling pressure, the postal group was perceived to be struggling with a shrinking snail mail operation, which was its bread and butter. After the postage rate hike that boosted the group’s profits in FY2011, Pos Malaysia had not been able to deliver exciting growth. Nonetheless, the minority shareholders approved the acquisition. DRB-Hicom’s stake increased to 53.5% stake after the deal. Without the deal, Pos Malaysia would not have been able to sign a memorandum of understanding with Lazada Group to set up the RM60 million e-commerce regional distribution centre in Sepang. The centre will provide value-added services such as air-sea-land transportation solutions, international transshipment, postal and courier services, and warehousing facilities. Previously, Pos Malaysia was more involved in business-to-consumer (B2C) transactions. However, with the e-commerce boom, Pos Malaysia opted to go into the business-to-business-to-consumer (B2B2C) model. It intends to have a presence along the entire supply chain. For example, the postal group is providing services ranging from custom clearance to warehouse and last-mile delivery. “In the past, we focused a lot on B2C, never B2B, but now, the industry has started to change [with the boom of e-commerce] and a lot of SMEs (small and medium enterprises) are going into e-commerce,” says Shukrie. Leveraging its existing assets, Pos Malaysia is transforming its entire infrastructure into an e-commerce set-up. “This is where I am leveraging the strengths that we have, looking at the assets that we have and studying what we can do with them. So, as part of our transformation, I asked the employees to think of leveraging what we have, rather than to acquire assets. “We practically spent no additional cost on buildings and land. We only invest in fieldwork to make the place ready for the installation of machinery,” Shukrie adds. In short, his strategy is to sweat the existing assets to cultivate new income streams. For instance, the warehouse at Bandar Baru Bangi PosLaju has been turned into a complete PosLaju centre, complete with drive-through services. “As we focus our efforts on strengthening our e-commerce capabilities, we continue to improve our productivity and the efficiency of our existing postal and courier operations,” he says. In line with this was the acquisition of KLAS, renamed Pos Aviation, to provide total point-to-point services to support e-commerce players such as Lazada Group and Alibaba Group. Pos Aviation already has warehousing space that can be made e-commerce ready, and its freight-forwarding business unit also complements its point-to-point services. Pos Malaysia has also launched new services such as Pos Laju EziBox (parcel lockers), an e-commerce hub and Pos Laju Prepaid Dropbox. “These new services enable customers to post parcels without needing to queue up at an outlet,” says Shukrie. Pos Laju Prepaid Dropbox allows customers to drop off their parcels at automated machines while Pos Laju Extra EziBox allows customers to pick up parcels 24 hours a day, every day. “By extending our range of products and services as well as enabling our customers to tap into our services in a convenient and seamless manner, we are ultimately helping them connect with others so as to accomplish more in a world that is more networked than ever before,” he says. All in all, Pos Malaysia’s 13 key initiatives are a digital mailbox, e-commerce, supply chain and fulfilment, trade facilitation, Smart Postman, Pos Ad, space utilisation, digital business centres, delivery optimisation, integrated processing hub, digital money services, EVOKE (enhanced value of key estates) and data analytics. 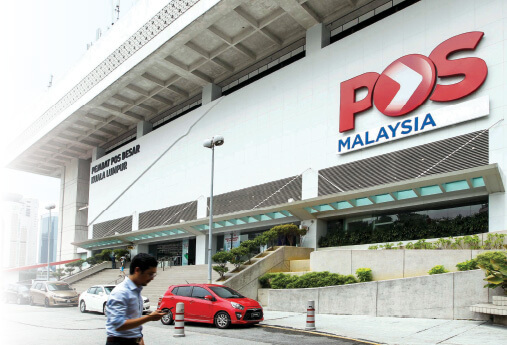 Instead of spending big money on mergers and acquisitions like postal groups elsewhere, Pos Malaysia is leveraging the assets it already owns. This may be a slower way to reap the fruits of its labour but it is a less risky route. Across the Causeway, Singapore Post booked an impairment charge of S$208.6 million in the fourth quarter ended March 31, 2017, of which S$185 million was attributed to a write-down of TradeGlobal, a US-based end-to-end e-commence provider that the postal group acquired for US$168.6 million in 2015. (See stories on Pages 36 and 37). When DRB-Hicom Bhd bought the 32.21% stake in Pos Malaysia Bhd from Khazanah Nasional Bhd, it sent only one management representative — Shukrie. 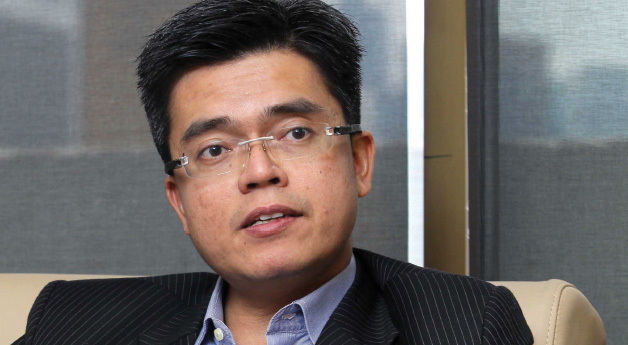 “We were told not to rock the boat when we (DRB-Hicom) took over (the reins),” says Shukrie. But his rational mind told him that Pos Malaysia, which has been in existence since before Independence, needed to be transformed in order to survive. Postmen’s jobs could not be confined to delivery of mail. “Many people were telling me that Pos Malaysia was a very old-fashioned organisation. I was (then) the casualty sent to Pos Malaysia,” says Shukrie. With eight unions in the former GLC, one can just imagine the condition of the road to transformation the 37-year-old was facing, not to mention the shrinking snail mail volume in the age of the internet. But things turned out to be better than expected mainly because Pos Malaysia’s employees also realised that they needed to evolve. “Despite what other people say, I find that the transformation in Pos Malaysia is probably one of the easiest because everybody (in the group) understood the urgency of the transformation and more importantly, the employees support the transformation process,” says Shukrie. The management has mapped out a transformation plan that seems promising. But, realistically, it is the bottom lines that count in the long run. While expecting double-digit revenue growth, Shukrie acknowledges the need to widen the group’s profit margin. Also, he admits the profitability of the courier and other delivery services is not as good as the traditional snail mail operation. Pos Malaysia was once a monopoly and now it has to compete with other — big and small — companies. With its network of 700 post offices and 7,000 postmen plus 3,000 courier delivery workers, will the postal group win in the e-commence battlefield that is getting more and more competitive?